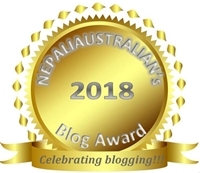 This entry was posted in Nepaliaustralian Blog Awards and tagged awards, Best Blog Design 2018, Best Blog for 2018, Best Blog Post of the Year 2018, Best Fashion Blog 2018, Best Fashion Blog Post 2018, Best Food Blog 2018, Best New Blog 2018, Best Personal Blog 2018, Best Photo Blog 2018, Best Photo Blog Post 2018, Best Travel Blog 2018, blog award, blog awards, Most Diverse Blog 2018, Most Educational Blog Post 2018, Most Witty Blog Post 2018, Nepaliaustralian Blog Awards, Nepaliaustralian's Blog Awards, personal blog. Bookmark the permalink. how do you reblog this???? I m sharing my Amarnath Travel experience. It is a lengthy blog , so I posted in 5 posts. Please let me know for any information required. It’s time to nominate! Throw some light on the blogs you love! Go ahead and nominate your favorite blogs, Beautiful People! Thank you, Nepalaustralian, for hosting this prestigious award every year, and good luck to all the nominees!